Schlumberger perfected the “paillone” enameling technique, one that he resuscitated from an eighteenth-century art. This involves creating translucent colors by layering enamel over gold leaf. His paillone enamel bracelets created for Tiffany were de rigeur for chic women in the sixties and seventies and became most famous on the wrists of Bunny Mellon and Jacqueline Kennedy, hence the moniker “the Jackie-o” bracelet. One of four artists ever allowed to sign their work for Tiffany, Schlumberger created designs that look fresh and new today. Iconic design always feels new. We present five iconic bracelets, just in. 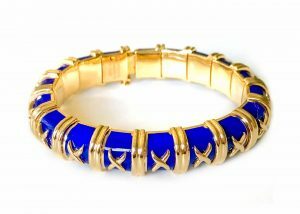 Schlumberger “Croisillon” paillone enamel bracelet, signed Schlumberger for Tiffany and co, France. 18k yellow gold with push clasp closure and safety catch. Fits most wrists. Enamel in very good condition. Ca. 1970s. “Niloticus” design made in France, signed Hermes, France. 18k polished rose gold in an abstract “caged” design. Fits most wrists. Width is 2½ inches. In original Hermes orange box. 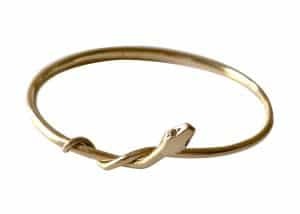 Vintage 14k gold and elephant hair bracelet. Elephant hair (no longer legal but hopefully nobody was hurt when taking the hair) is highly collectible for its chic, sleek look and because it is believed to bring good fortune to the wearer. 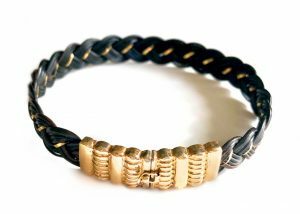 Safety clasp and 14k gold braided throughout. 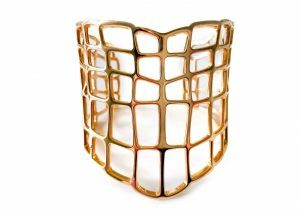 For a smaller wrist, this delicate cuff is true Gabriella Kiss style; just enough heft and subtle detail. Looks great alone or stacked with other bracelets. The snake’s eyes are diamonds. With stamp for Gabriella Kiss. 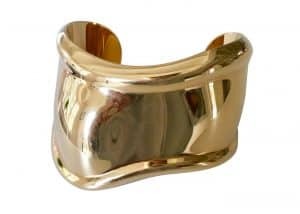 Designed to fit over the wrist bone in a chic twist, this iconic cuff is from the seventies and for the right wrist. 2.5 inches wide and 1.75 inches high (at widest and highest) with a 1.5-inch opening this fits most wrists. Signed Elsa Peretti, Italy.